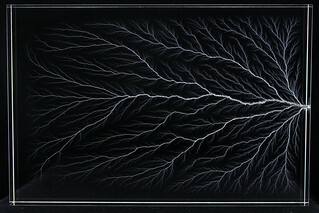 The term "Lichtenberg Figure" is used to refer to dendritic or lightning-shaped patterns, usually associated with electric discharges captured in materials. In this case it's a block of resin that got charged with electrons, which were trapped due to the electrical isolation property of the resin. I wish I could make these charged blocks myself, but a massive machine is needed, so these items aren't DIY. By hitting the side of the block of resin with a sharp object the electrons flow in the puncture hole and create a very high electromagnetic field. This field rips apart the material and the fracture travels all the way through the material until all electrons are released. 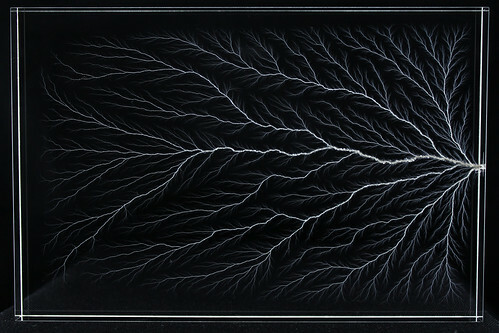 Using a black background and only lighting the side of the block, the micro fractures are nicely lit and show the whole dendritic structure.